With Peckham increasingly becoming one of the coolest London hangouts, I was all the more captivated by this Victorian house renovation on JJ Media‘s locations site. The owners are stylist, artist and art director Liza Giles and architect Matt Giles of Giles & Pike Architects. 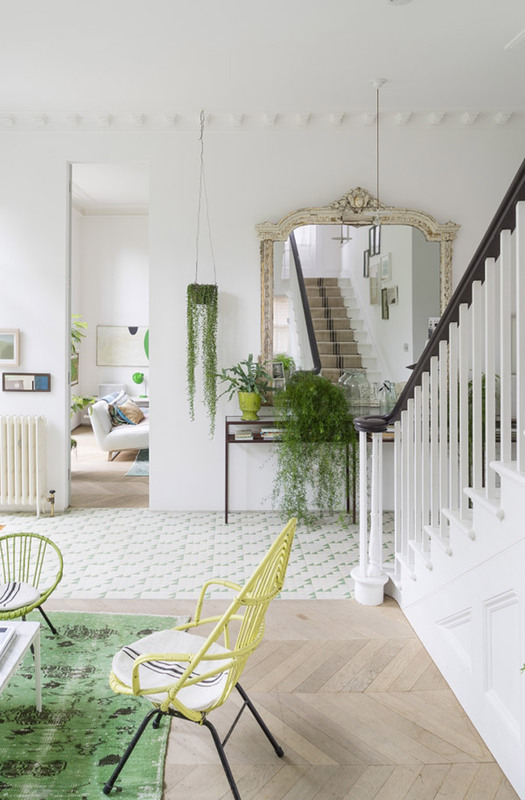 Their stunning light-filled home has beautiful high ceilings and period cornicing, made fresh and modern with a green and white colour scheme which runs through the entire house. 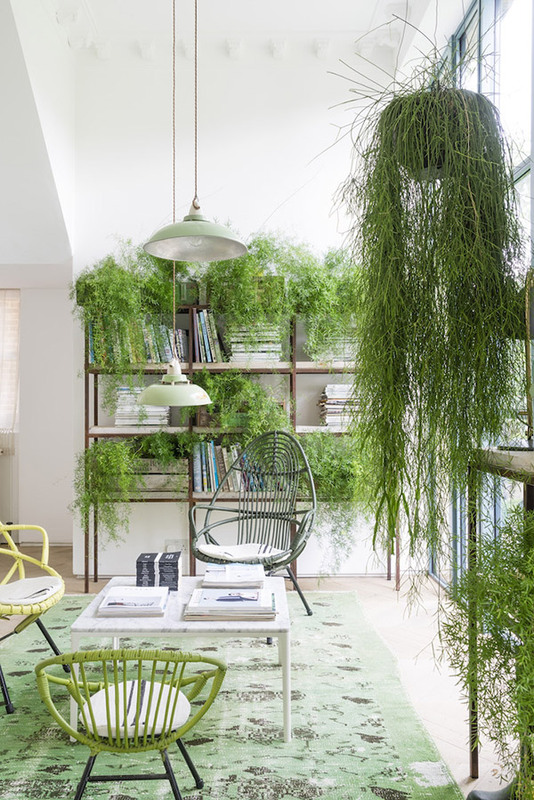 The buoyant botanical room pictured above proves you can never have too much greenery. Draping plants have been placed in some old wooden crates almost creating a live feature wall, as well as being hung from the ceiling in hanging planters. Industrial style shelving raised off the ground also shows off more floor space, making the room feel more spacious. The double fronted Victorian House is in the heart of Peckham, South London’s trendy hotspot. Huge windows bring maximum daylight and views of the large garden into the home. Each room exemplifies how it really is possible to mix styles from different eras. The mid-century dining table and chairs have been paired with a 1960s Murano Paolo Venini chandelier (here is a similar one on 1st Dibs) and a Louis XVI sofa is upholstered in a striking blue fabric. 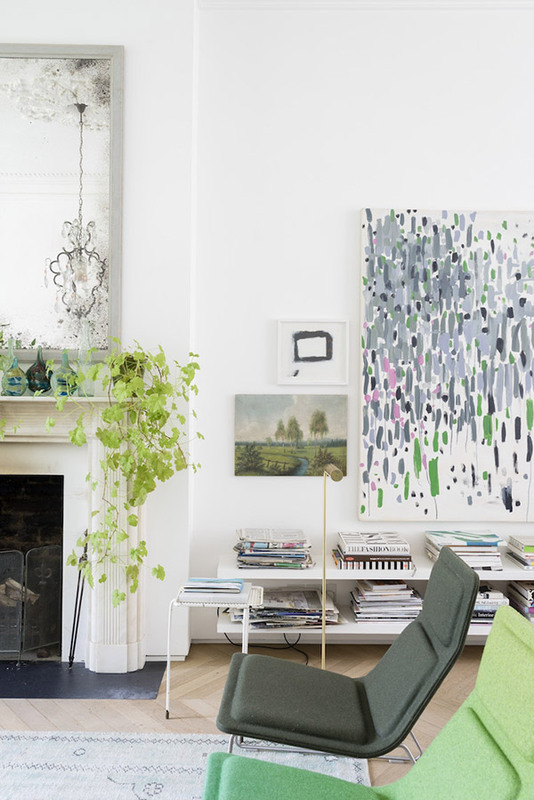 The use of plants and green accents throughout the house creates a beautiful fresh feel, personalised with works of art both old and new. In the living room, cascading plants creates a connection with the ornate ceiling rose and the greenery outside. In the kitchen pictured below, the chandelier above the marble kitchen island complements the high proportions of the room, along with more of the lovely original cornicing. 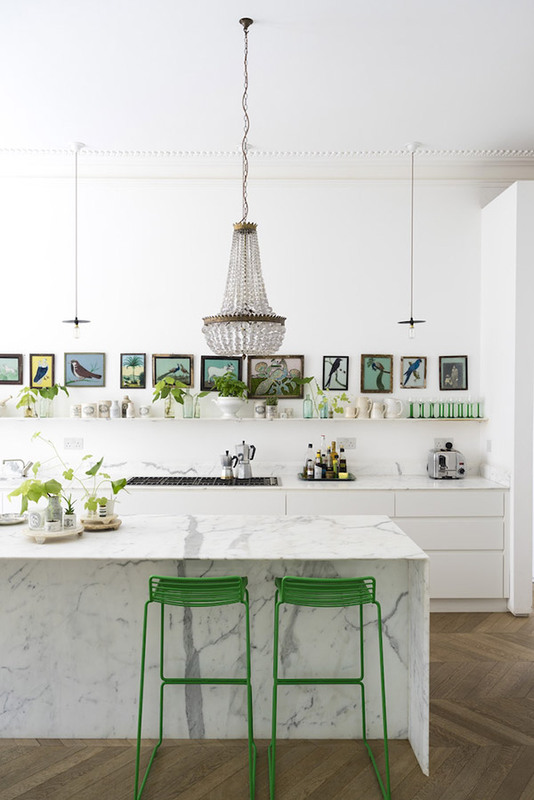 These are contrasted with angular elements such as the streamlined kitchen units, with a mix of green, blue and neutral tones tying everything together. 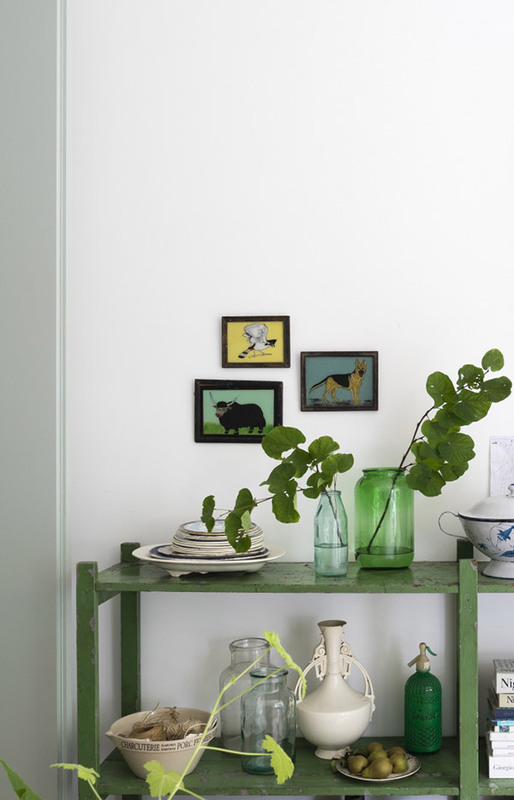 This green painted shelving unit provides a great place to display vintage plates, serveware, cook books and vases full of green foliage. In the bedroom below, flooring, lighting and furniture have angular and geometric elements, contrasting with the ornate cornicing of the ceiling, whilst a Moroccan Beni Ourain rug adds warmth and texture. A ‘headboard’ has also been fashioned from a strip of linen fabric. 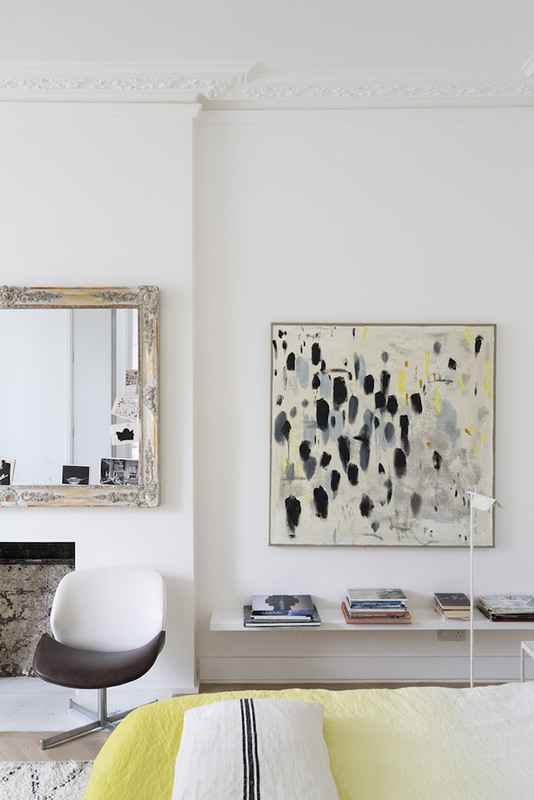 A baroque style mirror is juxtaposed with a retro chair and modern abstract artwork by Liza. 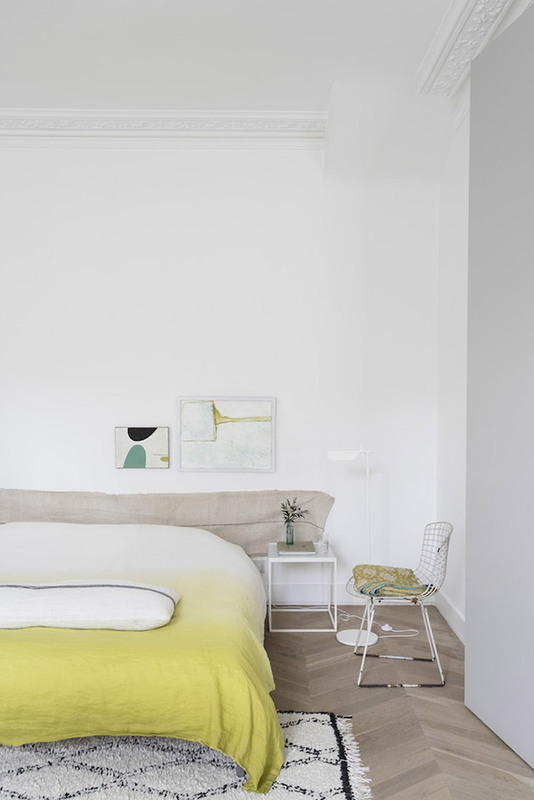 A monochrome palette with subtle hints of yellow draws everything together. This sloping ceiling lends to an indulgent yet cosy bathing area. The space is adorned with vintage glass bottles and frames and a hanging bulb light. 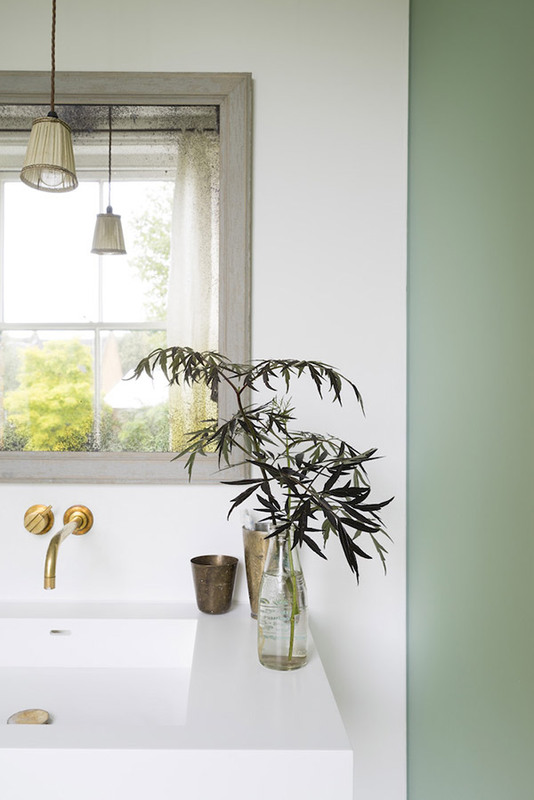 White walls may still be very much in vogue, but if you feel like doing something more daring, the bathroom is a great place to experiment with colour. 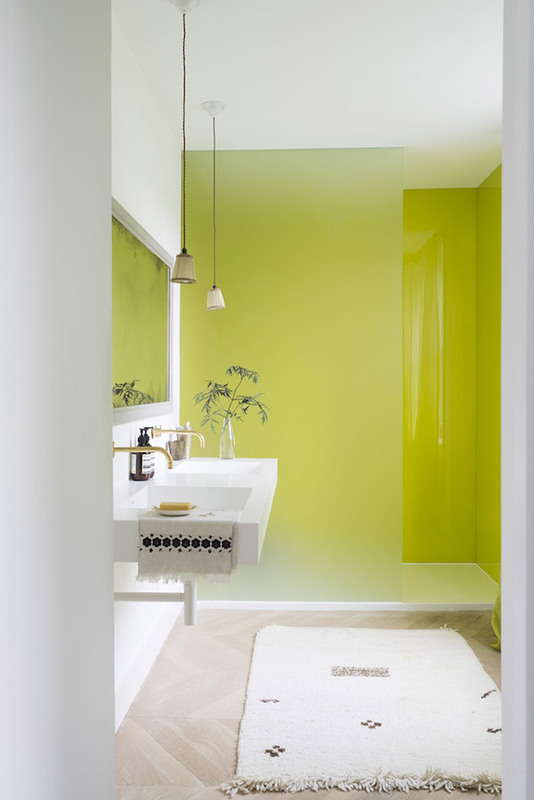 The bold use of pear green works perfectly in this luxury shower room. 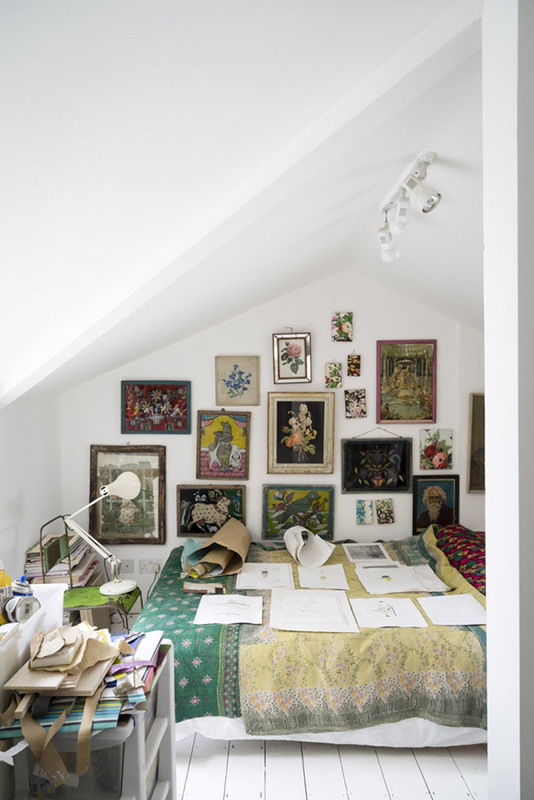 Upstairs in the loft area is a more bohemian space, an artist’s studio and bedroom decorated with old pictures, artworks and vintage kantha throws. Try Rebecca’s Aix Home for similar. Low hanging pendant lights are a key feature of the house, drawing attention to the high proportions of the property. 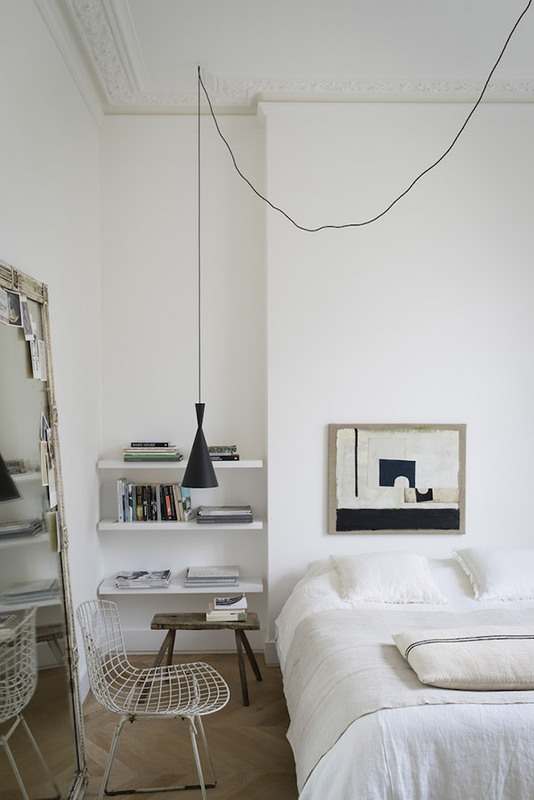 Ceiling or wall hung bedside lamps are a great way to free up more space on the bedside table. Below is the Beat pendant light by Tom Dixon, available at Amara. For a similar mid-century Bertoia chair try 1st Dibs or Chairish. 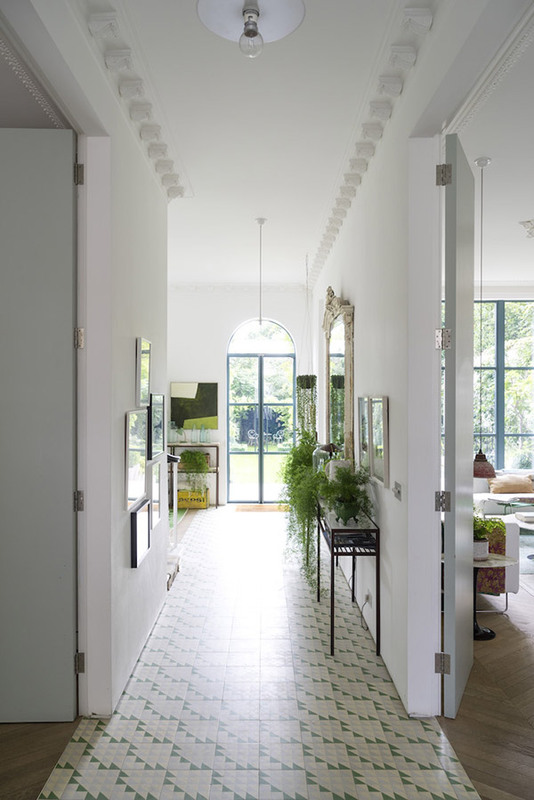 Geometric tiles were chosen for the corridor, leading the eye outside and continuing the green and white theme. 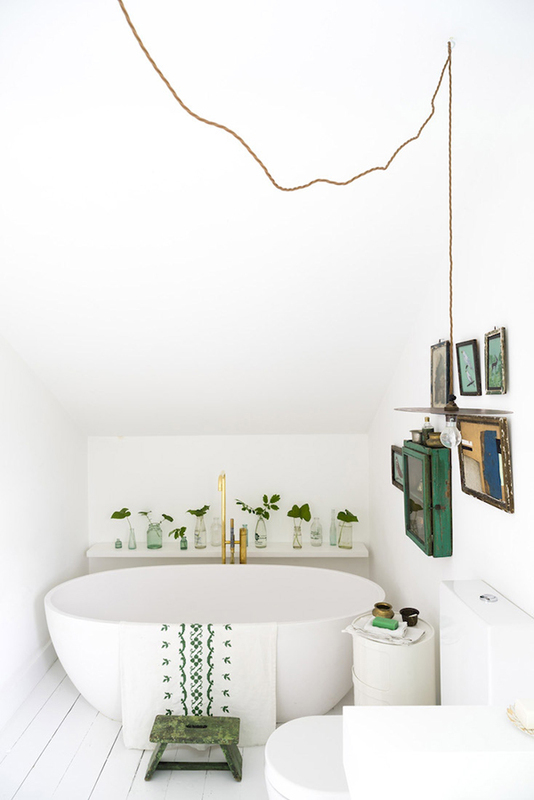 Greenery may be the Pantone colour of the year but (avocado bathrooms aside), does it never really goes out of fashion? 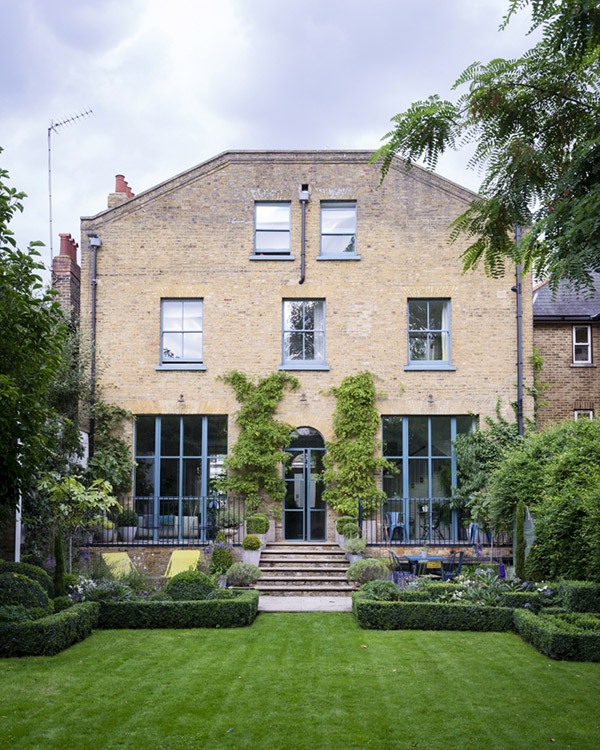 This house shows how green is one of the best ways to bring nature into the home, even in the heart of London. I hope you’re as inspired as I am!